The metal fabrication business is a lost art that is being rediscovered. Sales of fabrication tools and equipment are doing well. More types of tools than ever before are available, although quality varies. Expanded media coverage of collector cars is increasing demand for metal-fabrication services, too. "Metal fabbing" today is full of contrasts between "medieval metalworking skills" and modern tools like powered bead rollers and pulsed wire feed welders. The equipment in fabbing shops ranges from wheels once used to shape parts for Korean War aircraft to new Pexto bending machines. Ron Covell of Covell Creative Metalworking in Freedom, Calif. thinks that TV shows about building cars and bikes have opened the eyes of a lot of people who are starting to understand that metal fabrication is something they can do. Ron says rounding-over dies, which form a constant-radius curvature on the edge of a panel, are his best-selling tool, although pricier English wheels lead in dollar sales. "Although tool sales are an important part of our business, metal-fabrication workshops and DVDs are our primary focus," Ron stressed. 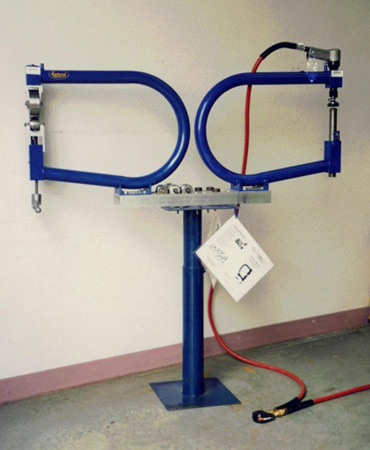 Bill Politsch, of Mittler Bros. Machine & Tool pointed to his Top and Bottom Sheet Metal Finger Brake as a popular tool for making both floor pans and hot rod interior panels. He said the English wheel — an air-operated model is new — is the preferred tool for forming curved parts like outer fender panels and hoods. Car builders also like the powered bead roller. Sheet metal brakes (priced up to $3,000) and tubing benders (up to $4,000) generate the greatest revenue. 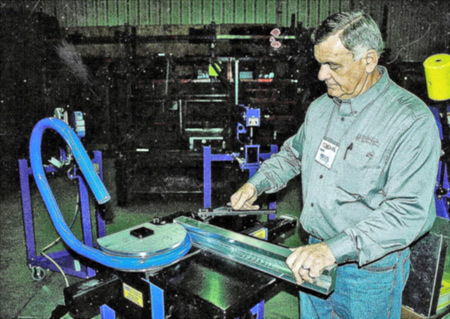 Bill Politsch, of Mittler Bros. Machine & Tool demos a tubing bender. At Roper Whiney, of Rockford, Ill., sales of small tools like the No. 37 shears and small hand brakes are important. The company's No. 5 Jr. Punch and Die is its top seller in units sales, while the larger, higher-priced Pexto bending brakes bring in the most revenue. There are actually collectors who specialize in collecting Pexto tools from the company's Pexto & Wilcox era. According to the Sheet Metal Museum in Pennsylvania, these collectors are called 'Pextonians.'" Trent Lewis of Midwest Metalworks zee-ed the frame on this rod he's building. English wheel and 20-ton press see lots of action at Eclectic Motorworks in Holland, Mich.
Eddie Paul of EPI Industries in El Segundo, Calif., built the full-size promotional cars for Pixar's "Cars" movie. He has also manufactured and sold over 1,000 English wheels and about the same number of planishing hammers, plus some 800 Tubing Rollers. Cheap knock-offs are starting to hurt his sales. 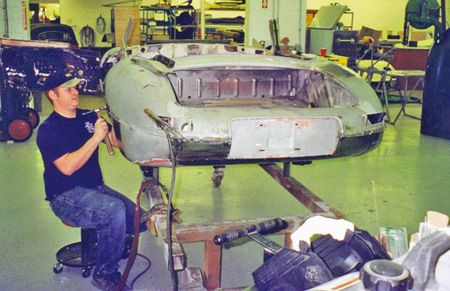 Bob Lorkowski's L'Cars restoration shop, in Cameron, Wis,, was planned as a facility to "do it all and do it right." L'Cars has been in business since 1989 and won a number of prestigious honors. It has a staff of specialists who work like coachbuilding teams of yesteryear. 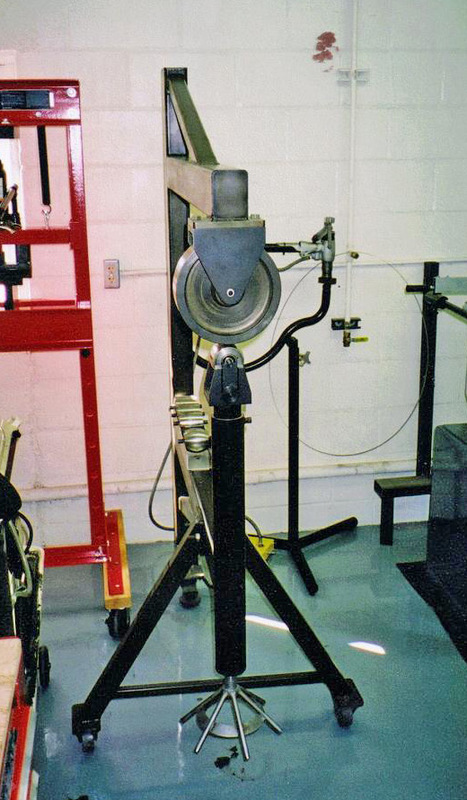 Metal-shaping machines and tools are everywhere and include a Magee wire edger, Pullmax's, Pexto's and various wheels and shrinking-stretching equipment. Lorkowski's Website www.LCARS.COM has a metalworking video on it. With its wheels, rollers and metal benders, the shop can recreate body panels for Classic automobiles like those that specially-trained coachbuilders once pounded out with hammers. A worker at L'Cars uses an old fashioned hammer and dolly to reshape some Jaguar sheet metal. 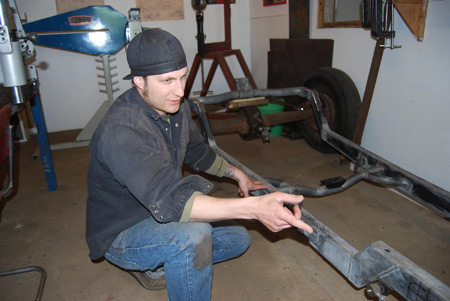 Steve Frisbie, of Steve's Auto Restoration in Portland, Ore., sees young and old people wanting to learn and get involved in metal shaping and lead work. Both of those trades, or skills, have been described as anywhere from 'black art' to 'lost art.' Original, old metal-shaping tools are extremely hard to find, says Steve. "This creates a market for English wheels, power hammers, dies, hammers and shear as well as videos, books and educational programs. Lefthander Chassis, of Roscoe, Ill., carries 50 books in its catalog and organizes workshops at trade show. Eastwood supplies DVDs, CDs, videos and books. Troy Ladd, of Hollywood Hot Rods, in Burbank, Calif., puts the English wheel fourth on his list of favorite fabrication tools. A planishing hammer is third. Second place goes to the traditional "good sandbag and good hammer." His top tool is the bead roller, but the tool used most in his shop is a 48-in. sheet metal brake. He also uses a shrinker-stretcher that he says he "couldn't live without." 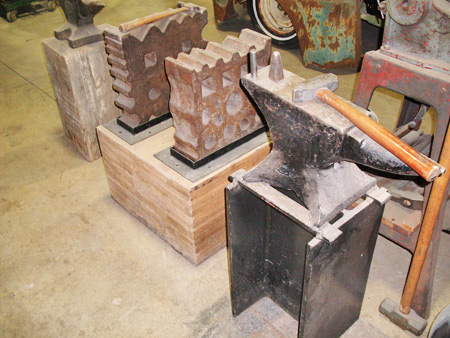 Old school tools like the hammer and anvil — especially this large set at Larry McCray's Automotive — can really shape metal. "Metal fabrication equipment is old school," says Ron Covell. "There's not a lot of new tools; there's a lot of people getting re-acquainted with old tools — but old tools that weren't around 10-20 years ago. That's why our biggest deal is training people to use tools that date back further than them in their design." Dave Comina, head fabricator at Bennett Coachworks Ltd, in Milwaukee, Wis., sometimes works on an English wheel originally made to fabricate exhaust shields for T-29 Trojan Warbirds — a Korean War era fighter trainer. The wheel is probably a decade older than the craftsman who uses it. Among the other fabrication tools and equipment at Bennett Coachworks are a Wel-Bilt 7-in. 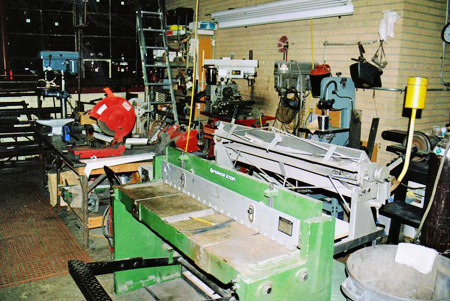 metal-cutting band saw, a Dayton 6x9 belt and disc sander, a Millermatic welder, a power shop shear, various rollers, a Rockwell drill press, a Delta 10-in. band saw, a 5-speed drill press, a Smithy CB 1220 XL LTD lathe and some Mittler Bros. tools including a planishing hammer, louver press and bead roller. 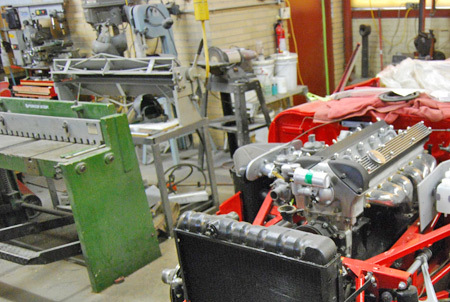 Bennett Coachworks in Milwaukee, Wis., uses an assortment of vintage and new metal fabrication tools. Bennett Coachworks in Milwaukee, Wis., uses sheet metal tools to shape parts for Ferraris and other cars. David C. Treichel, who operates his Treichel Auto Refinishing restoration business in the rear of the Zero to 60 Garage in Sherwood, Wis., says "My favorite tools are my 30-year-old hammers, my 49-year-old hands and my 40-year-old stump that I use to beat out the shapes on. It has a dished out area to make rounded panels, nice edges and there's also a crack in it that works great for shaping body lines. Dave also uses "old scholl" stuff like a shrinker-stretcher tool, shears, a sheet metal break and an assortment of anvils, dollies and pipes. The professionals told us there's not a whole lot new in an industry that focuses on age-old fundamentals. Shop owners are interested in adding inexpensive tools and equipment, but only as they can afford it. Many feel they can get by with traditional, basic metalworking tools that trace far back into history. Eastwood sells this English wheel and hammer combination for the hobby market.